The School of Media and Communication is based in a specially refurbished historic building at the heart of the University of Leeds campus. Our exceptional facilities include a range of flexible teaching spaces, a purpose-built cinema, a digital media lab, radio and television studios, and creative media suites. We have a 58-seat cinema equipped with Dolby Digital sound and high-definition projection facilities and projectors for 16mm and 35mm film. You can work on your own projects in any of our 80 editing bays, equipped with Avid Media Composer editing software and Adobe Creative Cloud. We also have 4k colour grading facilities in our five edit pods using DaVinci Resolve Studio. 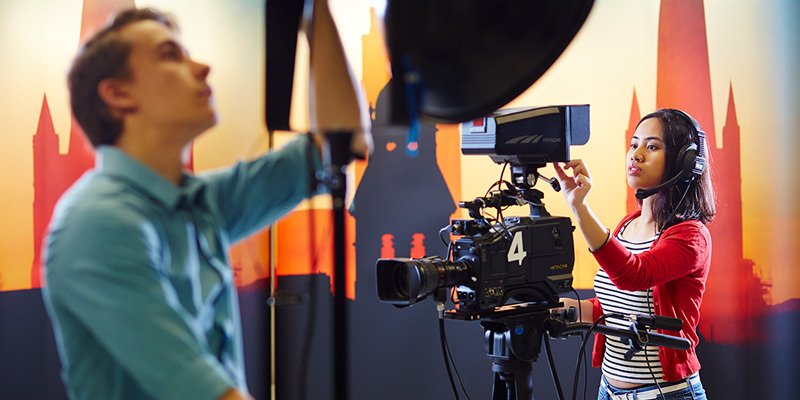 Our fully equipped TV studio has a large green screen area, lighting and photo-flash facilities. We have a track and dolly, sliders, Glidecam and various cranes, and you’ll have access to our photographic dark room. We run a loans service where you can borrow a range of HD digital camcorders, from 4.6k cinema style cameras to UHD documentary style cameras, and various Canon stills cameras as well as Fuji and Pentax medium digital format cameras, to help with your project work.